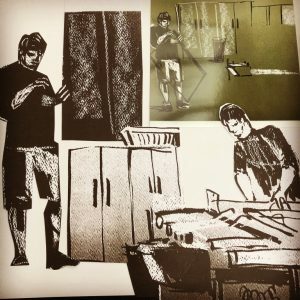 During 2018, Artist in Residence Helen Locke, who studied illustration at Liverpool and gained a Masters in Narrative Illustration at Brighton, spent a year documenting how the studio helps everyone from new graduates to practising artists to extend their skills in print. 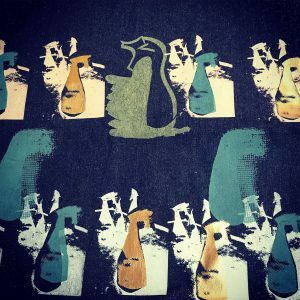 The Art Fund Gallery at the Lightbox will soon be transformed by an exhibition of textile and print pieces which showcase all that Ochre has to offer. Helen is a graduate of Liverpool John Moores University with a Masters in Illustration from Brighton, and after teaching and working as a technician, is well suited to using her skills at Ochre. Helen’s idea puts a spotlight on all that the studio has to offer: the tools of the printmaker; sponsors AD Colour who repair the silk screens; artists who make up the teaching team; disability groups who use the print facilities; visiting and resident artists, by drawing them and collecting quotes from conversations she ‘overheard in the studio’. The studio itself provides a wealth of imagery – the spray bottles used for cleaning make an exciting image when screen printed onto denim. 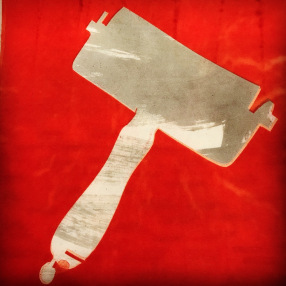 Helen experiments with copper foiling (also using the heat press) making an apron which celebrates screen print with a nod to Andy Warhol. Visiting Ochre sponsors AD Colour, Helen spent a day drawing; recording the screen repair process, where silk screens are glued and stretched to the correct tension on a massive scale. 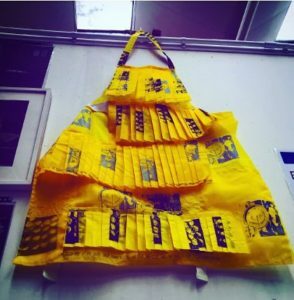 Leaving the unit in Shepperton with armfuls of waste silk screen mesh, she heat pressed, printed on and manipulated the fabric to create extravagantly pleated aprons fit for Grayson Perry. Helen also used neoprene to create utility bags featuring images from AD Colour – proof that not all utilitarian items need to be dull…! 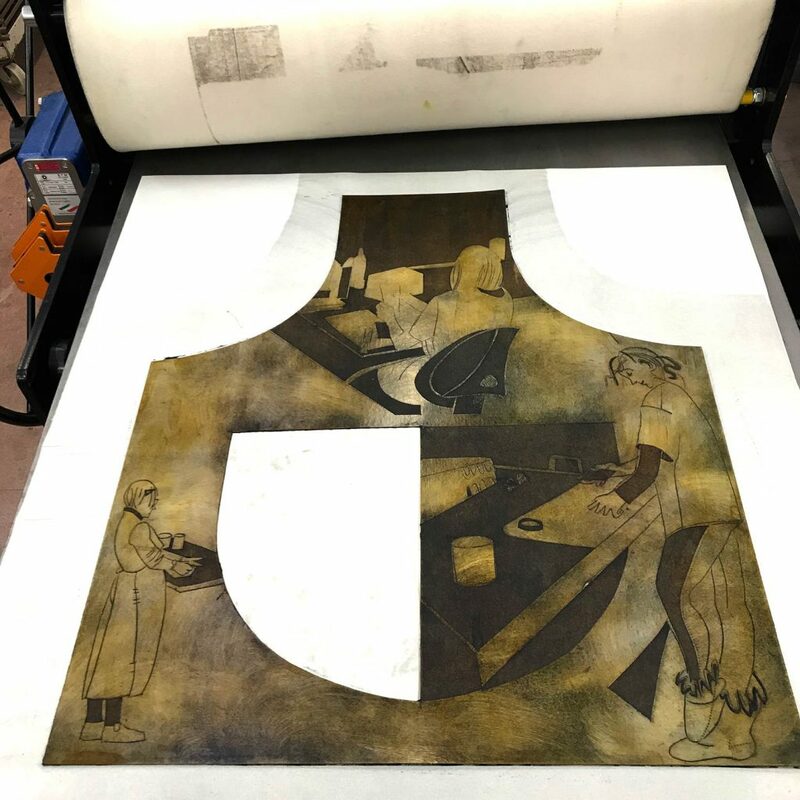 The etching tools have made their way onto an apron, as have illustrations of participants of a collagraph workshop run by Katherine Jones. 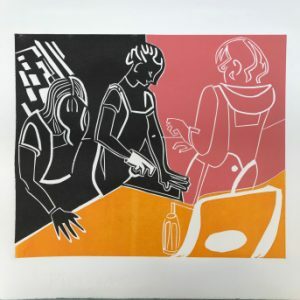 Here’s a Jigsaw Linocut from a ‘Relief’ course Helen attended during her residency. 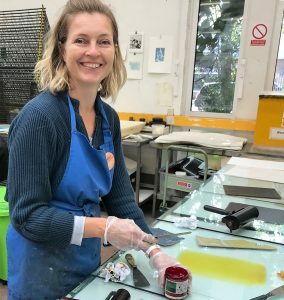 Finally (see below) Helen created an absolutely enormous plate (which only just fitted onto our BIG Hunter Penrose etching press) using ‘Environmount’ card to print a full scale paper apron showcasing her experiments in the ‘Intaglio’ printmaking processes. Helen’s work will continue to evolve in the coming months and will be shown at a further exhibition at Riverhouse Barn in Walton-on-Thames during the Surrey Artists Open Studios. 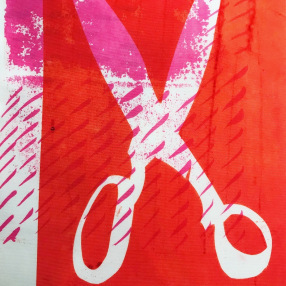 Dates for this are 5-16 June, with two workshops on Saturday June 15 where you can create your own apron…..but we will remind you of that nearer the time! 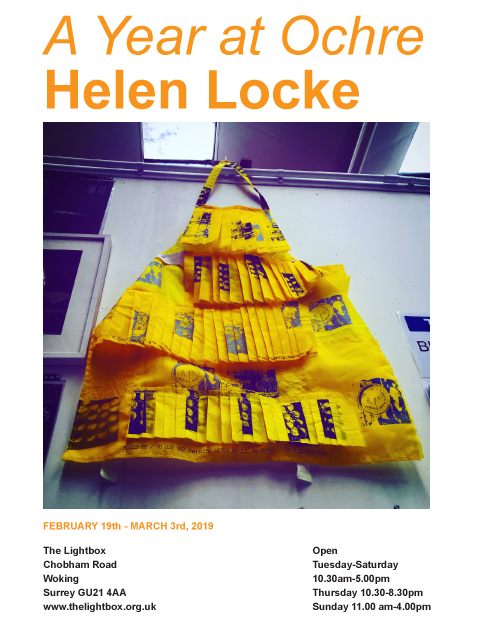 Do visit Helen’s exhibition at the Lightbox, where she will be creating the feel of Ochre studio by providing a table and chairs at which you can browse her sketchbook from the year. 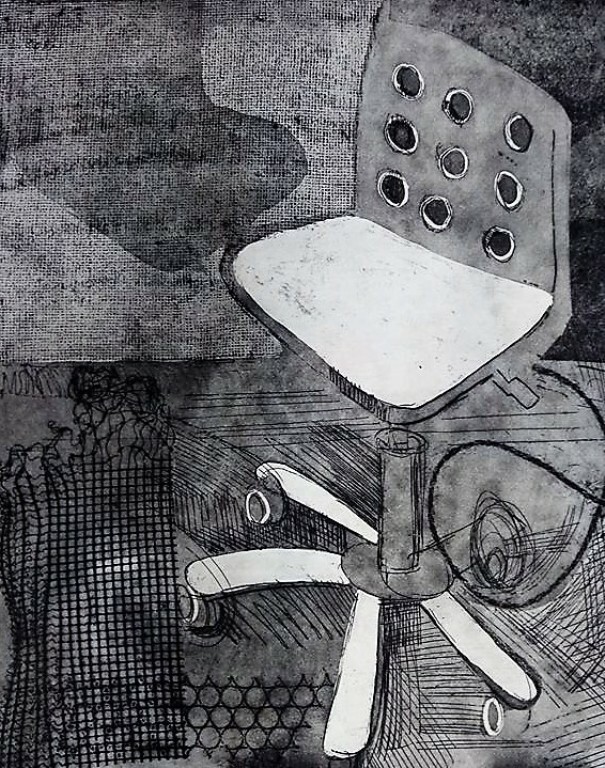 Helen’s charming print above is of one of our favourite chairs in the studio!